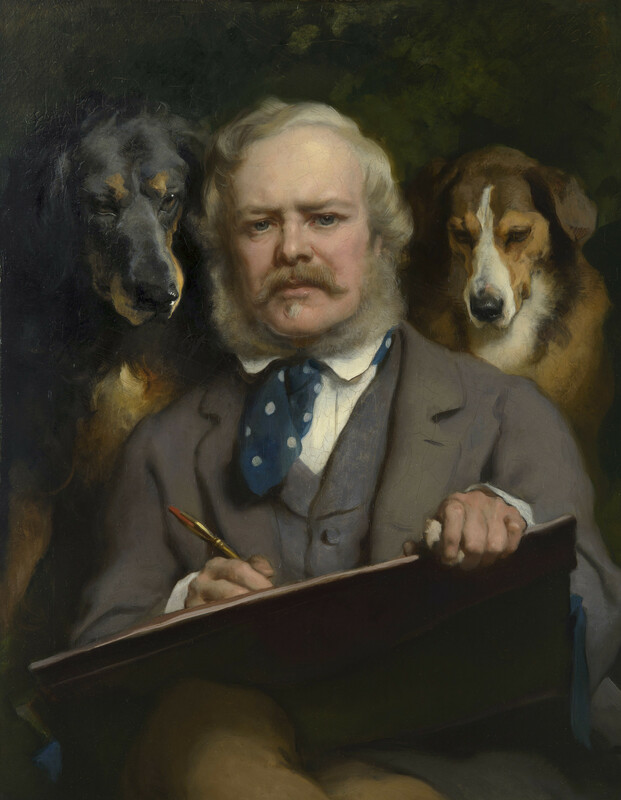 Edwin Landseer was the most famous English painter of his generation. Trained by his father, he was widely regarded as a child prodigy, producing a number of remarkably accomplished studies of animals when he was only five years old. In 1815 he joined the studio of Benjamin Roberts Haydon before being formally admitted to the Royal Academy schools a year later, at the age of 13. He was a full Academician before the age of 30.Between 1830 and 1840, his most fruitful period, Landseer specialised in paintings of dogs, of which about half were commissions. It was in this capacity that he first attracted the attention of the royal family: in 1836 he painted Princess Victoria’s pet spaniel, Dash, as a birthday present commissioned by her mother, the Duchess of Kent. In this self-portrait Landseer sits at a drawing board, a porte-crayon in one hand and two dogs behind him scrutinising his drawing. Although Landseer reportedly hated being watched while he worked, he liked having dogs in his studio. The two dogs depicted here are probably his own collie, Lassie (on the right), and a retriever called Myrtle, owned by Mr Wells, one of his patrons. In positioning the two dogs as connoisseurs of his work, Landseer implies that the untutored judge is better than the tutored. A photograph of the artist taken at around the same date (RCIN 2911991) suggests that Landseer used a mirror to make this self-portrait, as certain features appear in reverse.Interestingly, he seems to have been selective in the areas he corrects: his painting hand and the buttons on his jacket have been reversed, while his parting and the direction of both his crossed legs and his drawing board correspond to his mirror image. Perhaps the artist only corrected those aspects of his appearance that might arouse suspicion were they to appear back to front and he may even have used a photograph as a visual aid in the final stages of the painting process.